I had a decent dolsot bibimbop at Kum Kang San in Buffalo Grove today. Slightly smaller portion than Super H, but more panchan--kimchi, seaweed salad, coleslaw, potatoes and pickles along with a simple veggie broth soup. Also, even though it was in the hot stone bowl, the egg was cooked. However, I received something here that I never have at any other Korean restaurant (granted I have only been to two others) and I am curious as to what this was. Shortly after I sat down, I was given a light tea colored drink in a plastic glass. No ice, at room temp. It tasted like a watered down orange flavored tea--well that makes it sound good, but it really wasn't. Anyone know what this was? I didn't ask, bc I didn't want to look like a goob. Last edited by CM2772 on May 22nd, 2010, 6:02 am, edited 1 time in total. at their place in the city, we received barley tea--it was the only thing served hot! Vinny wrote: The so-called "Delmonico's" in the pedway by Illinois Center (Lake/Michigan) has bibimbop, both the regular and dolsot. Quite good actually, and very reasonable. Thank you kind sir! I went to Delmonic's today and, while not the best bibimbop I've had, it was pretty darn good. Most importantly, it's within walking distance of the office. I'm very happy to have this in my rotation now. Lunch at Kang Nam Galbi today, three of us split mandu, chap chae, grilled mackerel and Dolsot Bibim Bop. Panchan, like the majority of the meal was just fine, a satisfying, if not exactly head spinning, lunch. Dosot Bibim Bop, on the other hand, was terrific, volcanically hot, rich with raw egg and scattering of marinated grilled meat, veg for crunchy, crumbled nori adding oceanic saline zing and deliciously toasty crisp rice as reward for working through the tongue blisteringly hot dolsot bibim bop. deesher wrote: Cho Jung makes a pretty tasty version. That, coupled with the fact that I would pay whatever the cost of the meal was just to eat their panchan puts this high in my list. The pajun is also exceptional. I agree. A very nice version, indeed . . .
and I agree wholeheartedly about the panchan, too. Still wonderful the other night, piping hot in its stone bowl. The accompanying banchan included some lovely, heavily gingered house-made kimchi. The miso soup was very comforting. And the service was exceptionally gracious. Just the thing for a cold winter's night. Bibimbap at Noon Hour Grill/Susie's yesterday hit the spot. I love the crunchy rice of dolsot bibimbap, but the really stellar components and overall composition of Susie's non-dolsot version make me forget all about the missing hot bowl. 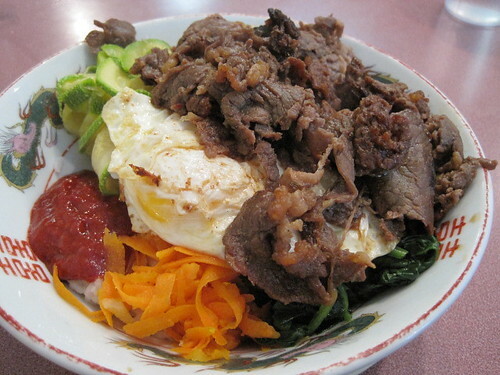 This bibimbap tips toward a bulgogi dish, though I don't mind the especially generous heaping of beef since I enjoy the lighter, tangier marinade at Susie's. Bonus is that after I'm done eating, Susie checks my plate exactly like Mama happy_stomach did when I was a kid--both Susie and my mom relatively short women, who silently look down into my bowl as if standing from very high above me to inspect how much I've eaten. I have yet to find out what happens if I don't finish my food. happy_stomach wrote: Bibimbap at Noon Hour Grill/Susie's yesterday hit the spot. I love the crunchy rice of dolsot bibimbap, but the really stellar components and overall composition of Susie's non-dolsot version make me forget all about the missing hot bowl. I should have gone to Susie's as my H-Mart Korean food kiosk bi bim bop was blah, boring, banal. Lifeless veg, overworked minimal meat, soft yolk egg devoid of flavor. Even a generous glug of gochujang could not liven the dish. G - while much of what you get at that food court depends on whether or not you hit that magic time when the vegetables aren't wilted, I have had a very good Dolsot Bibim Bap there. Certainly, the meat wasn't more or better than in your picture, but the rest of it was tasty. H-Mart also has the advantage of offering dolsots for sale; I've been discovering all kinds of sneaky uses for mine. I've had food from the kiosks that was fine, never anything to write home about, but as a fill-up to prevent massive H-Mart shopping cart build-up they work. Mhays wrote: H-Mart also has the advantage of offering dolsots for sale; I've been discovering all kinds of sneaky uses for mine. Yes - I would never call anything I've had at the H-Mart food court stellar, but you definitely need to hit the right time of day...while I've had good food, I've also had food that I've surreptitiously tossed - nothing scary, but re-fried pre-fried tempura and soggy kimbap not my thing. Usually, if you look carefully, you can see when it's not going to be a good day - but the made-to-order dishes are a little trickier. As for the dolsot - it's basically a concave pizza stone, right? I've done a couple experiments using it as a baker that are discussed more fully on my blog. Mhays wrote: G - while much of what you get at that food court depends on whether or not you hit that magic time when the vegetables aren't wilted, I have had a very good Dolsot Bibim Bap there. Certainly, the meat wasn't more or better than in your picture, but the rest of it was tasty. Kind of embarrassing to ask, but do they sell the dolsot bi bim bop in the piping-hot stone container at H-Mart? Just wondering if the dolsot modifier (optionally?) applies for meals straight from the food court, or if it's simply available as a separate cookware purchase. Yes, they sell Dolsot Bibimbap in the food court - it's a handwritten tag-on to the menu, I think...IIRC it's the booth to the left of the snack shop that specializes mostly in soups. It's been a while. I've just recently moved offices to the Sears Tower and am exploring the eats in the neighborhood. Silk Road, and otherwise undistinguished Ameri-Chinese lunch spot, was advertising a bi bim bop special, so I popped in. Once I disposed of the spring green mix that was in the corner, everything else was solid - good rice, nice variety of vegetables (zucchini, sprouts, cucumber, carrots), beef bulgogi, and a fried egg with a nice, runny yolk. The bulgogi was chopped beef, and not particularly good, but not bad either. Once everything was mixed up with some gochujang, it was pretty tasty. It's no Korean Seoulfood (right near my company's other office), but it's a good option to have nearby. dansch wrote: I've just recently moved offices to the Sears Tower and am exploring the eats in the neighborhood. Silk Road, and otherwise undistinguished Ameri-Chinese lunch spot, was advertising a bi bim bop special, so I popped in. That old Silk Road was around when I was a summer associate working around there back in <cough> 1997, and a colleague of mine at the time called it Silk "Middle Of The" Road, which based on your description, is how the food still tastes; everything is adequate, but nothing is great. As most of these places that are recommended seem to be closed, can anyone give some current recommendations for a really good dolsot Bi Bim Bop? Chefcon, this place will give you everything you need. Bibim bop, dolsot bibim bop, goat stew, and the panchan...just excellent. Mom & Pop-type place. No stone bowl option, but the humble bibimbap at Seoul Corea in Hyde Park is plentiful and excellent; I'd been away for too long and am glad they've returned lunch pricing and the full appetizer list to the menu. I have the dolsot bi bim bop at Del Seoul almost weekly. Fantastic. GNR Winner San Soo Gab San also has excellent dolsot bi bim bop. 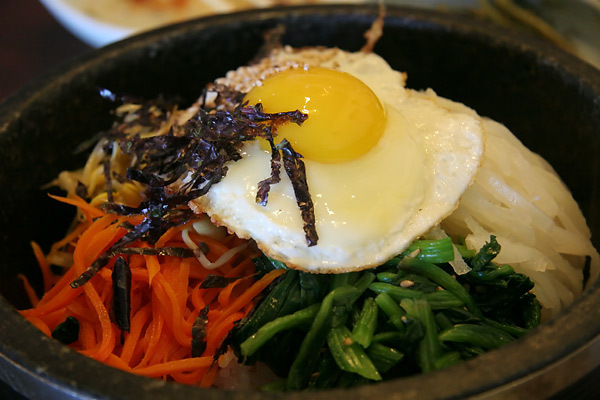 We find ourselves heading to Assi Plaza these days for lunch when we go to HMart. Slightly lower price points and generally better tasting food! The dolsot bi bim bap at the Assi Food Court is really good and generous. My exposure to bi bim bop is limited. I've always enjoyed the preparation offered by Susie at Noon Hour Grill in Rogers Park. It's very comforting, prepared and served by what could be my Korean grandmother. Has anyone had the bibimbop at Cho Sun Ok (which is in my opinion probably the most glaring absence on the GNR list)?? If it's as good as the rest of their offerings, it is probably one of the best renditions in Chicago. Agree. Cho Sun Ok is hidden in plain view. Have not had the BBB. Note that a number of neighborhood diner/quick serves that are Korean-owned have BBB. Hamburger King is a prime example. But let's not forget the enduring Hound Dogs Burgers & Teriyaki on Grand. And also, don't forget that there is a difference between bi bim bop and dolsot bi bim bop. Not all of the places mentioned serve the version in a dolsot. We were in the area and hit this place up for the Dolsot bibim bop and it was really good. Thanks for the recommendation. The entire meal, Goat stew, Bibim Bop and chop chae was really delicious. Found another very good dolsot bi bim bop at Koreana in Schaumburg. Family-run, attentive staff, good panchan (although not quite up to Chun Ju standards), all the attributes I like in a solid Korean restaurant. This near-perfect dolsot resided in that hot stone bowl, nicely proportioned with ingredients and topped with the requisite runny egg. Also enjoyed a magnificent seafood & scallion pajun (pancake), which was reminiscent of--and even better than--the traditional Vietnamese banx xeo, the the shrimp-and-veggie filled crepe. This was a tad heavier, but chock-full of octopus, squid & shrimp. Eaten cold as a leftover (because there was enough for four) with a squirt of their homemade sriracha, it's almost like an Italian frittata. Just yummy. Koreana also does BBQ, and at 5:30 last night most of those tables were full. Crisp is probably my second favorite restaurant in Chicago period, but I think their bi bim bop actually is pretty weak, and I've had it numerous times. I think the one at Joy Yee's in Chinatown is actually the best I've had in Chicago so far. They simply call it 'Traditional Stone Bowl Rice' in English and it's $8.95. The sauce is delicious, and egg is cooked perfect. I think it could use more meat, but then again I don't really buy bi bim bop for the meat, but for the veggies and other goodies in there. Does anybody know of any standout ones in or around Ukranian Village? ....I once ordered bbb from Joy Yee on Irving and what came bore only the most superficial resemblance to the Korean dish. It was basically beef teryaki and American broccoli on rice with a fried egg on top. I've had better at fast food places in the Loop. I'm assuming they do it differently in Chinatown. I have heard OK things about Tozi, which is newish and near Ashland and Milwaukee..